April 10, 2018 August 31, 2018 Phillip Multop Comments are off. Featuring senior managing officers from several of the largest and most recognized financial companies in the country. Myth #1: Annuities are prohibitively expensive. Myth #2: Annuities provide no additional value when held by a qualified plan or an IRA. Myth #3: Annuities are not good because gains, when withdrawn, are taxed at higher rates than other investments. Myth #4: Death benefits are not worth the money. Unsure about your death benefits? Ready to maximize income options? Open-minded to a new perspective? It’s time to bust the myths and debunk the misconceptions about annuities for the last time! Find out how these insurance vehicles may complement your portfolio needs. Many annuity strategies can provide lifetime income and death benefits to your beneficiaries. Don’t miss this opportunity to learn more about the wide array of annuity options that might be the missing piece of your retirement portfolio. 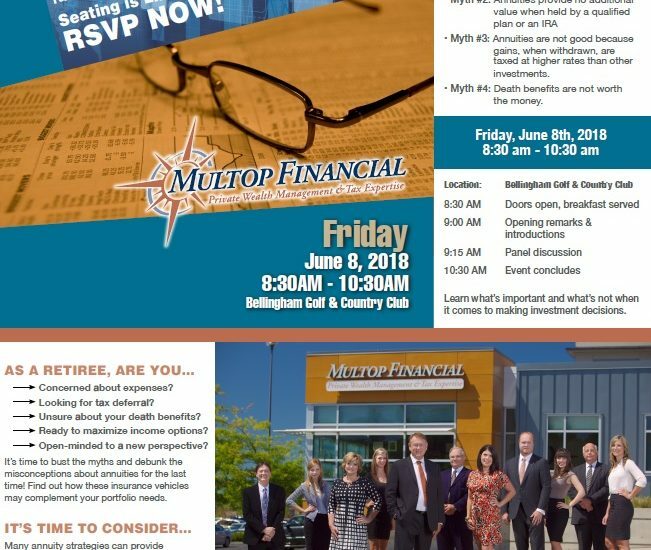 RSVP to lettie@multop.com or call (360) 671-7891. Space is limited. This event is funded in whole by Jackson National Life, AIG and Lincoln Financial Group. Securities and advisory services offered through LPL Financial, Member FINRA/SIPC, an SEC registered investment advisor. Multop Financial is not an affiliate of LPL Financial, and offers tax and accounting services separate and apart from LPL Financial. Pay the doctor & save tax, too!